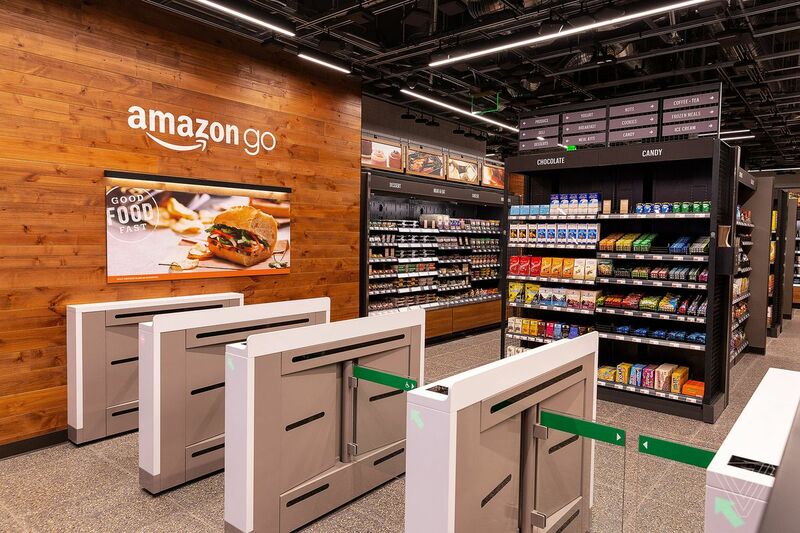 Technologies have replaced human cashiers; shoppers are automatically billed via the credit card connected to their Amazon account, detected as they leave through the gates. Multiple people can shop on the same person’s account by scanning in the account holder’s phone again, and in-store cameras recognize that person as authorized. A major goal is to reduce queuing times at cashiers by adding automation technology to in-person retail. Items for sale consist mainly of grab-and-go lunch options such as yogurt, meat sandwiches, and salads. Weight sensors detect when items are taken or put back onto shelves. Products placed back on shelves are automatically deleted from the shopper’s virtual cart. Hundreds of cameras follow shoppers around the store, able to distinguish between different shoppers by body type, although the company insists there is no facial recognition used. During a test phase, children placing items on incorrect shelves proved an unanticipated challenge.